If you’re bullish on Amazon.com (Nasdaq: AMZN) and China, chances are you’ve heard of Dangdang (NYSE: DANG). Dubbed the “Chinese Amazon” by mainstream media looking for an alliterative Asian ally, Dangdang’s been hyped up as the second chance for investors who missed out on Amazon’s ridiculous stock growth. However, a deeper look at China’s online marketplace reveals a couple of competitors ready to snag Dangdang’s rising sales. Arguably the biggest Mum and Dad shop in history, Dangdang was founded in 2000 by couple Peggy Yu Yu and Guoqing Li. Through a variety of subsequent acquisitions and business developments, Dangdang quickly rose to fame as the premier Chinese online bookstore. From 2009 to 2011, unique visitors more than doubled from 910,000 to 1.9 million. Dangdang currently operates 19 logistics centres across China, totaling 340,000 square metres of warehouse space. Despite its growth, Dangdang’s market history reveals a compelling story for the bears out there. In 2010, the company had an IPO at US$16, a price that Li felt was grossly undervalued. In a not-so-subtle Internet post to underwriter Morgan Stanley, Li wrote: “My CFO was in panic mode, I held back a breath and silently cursed you [expletive deleted].” I can’t help but wonder what he thinks of Dangdang’s current price under US$5.50. Elephant in the room: If you’re looking for the obvious reason why Dangdang might not be the “Chinese Amazon” that has bulls foaming at the mouth, look no further than, well, Amazon.com. Amazon first knocked on China’s door in 2004, when it acquired joyo.com for US$75 million. With five years of experience and invaluable cultural wherewithal, joyo.com was the perfect stepping stone for this online giant. Amazon has since expanded its Chinese warehouses from 14,000 square metres to 400,000. Its name has also changed, first to “Joyo Amazon” in 2007 and then “Amazon China” last year. With less than a decade on the ground, Amazon China currently accounts for 2.3% of all retail sales in China. Who will work the network? Amazon’s brand and distribution channels are powerful worldwide, but another reason it’s trounced competition in the states is its incredible network effect. Buyers head to Amazon.com because that’s where sellers are, and vice versa. The all-powerful network effect has both helped and hindered online auction site eBay (Nasdaq: EBAY). In the U.S., the word “eBay” is interchangeable with “e-auction.” However, eBay’s 2001 entry into Japan didn’t work out so well because of Yahoo!‘s (Nasdaq: YHOO) 95% market dominance. eBay eventually pulled out entirely in 2002, only to slink back five years later with a (undoubtedly Yahoo!-centric) joint partnership agreement in hand. Since the network effect is really just a fancy way of saying “all the buyers and sellers come here to do business,” let’s examine some hard numbers to see who’s ahead. An Analysis International sales report provides direct insight into which companies currently dominate the online Chinese marketplace. Source: Author, data from Analysys International. As you can see, the success story of Dangdang suffers another blow. 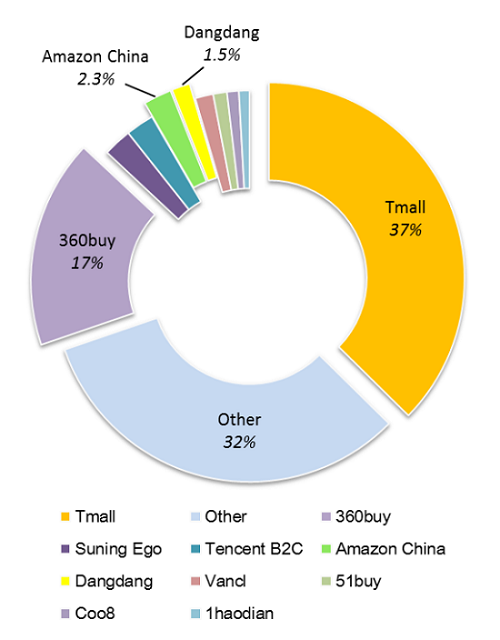 Not only does Amazon China enjoy 50% more sales than Dangdang, but online giants Tmall and 360buy collectively dominate over half the entire market. Just as Dangdang is erroneously considered China’s Amazon, Tmall (plus its other half, Taobao.com) is often wrongly compared to eBay. In truth, the distinction between online auction sites and online retail sites is quickly blurring. Features like eBay’s “buy it now” price show that consumers don’t really care how they buy something. Discount matchmaker priceline.com‘s (Nasdaq: PCLN) historic success proves that customers don’t even really care who they buy something from, as long as they get the best price with reliable service. Tmall is just as much Dangdang’s competitor as Amazon China is, and Tmall is nearly 25 times as large. Alibaba Group Holdings, of which Tmall is a subsidiary, has plans for an IPO already in the works. Tmall seems to be the obvious victor for Chinese online retail, but I’d also give Amazon its due based on its larger global network effect. No matter what, my money isn’t going anywhere near Dangdang. It’s got a relatively tiny network effect, no scale advantages, net negative income for the past four quarters, and declining sales last quarter.